Slice the pumpkin to 8 wedges. Arrange the wedges in a baking tray, splash in generous amount of olive oil. Pumpkin will soak up oil. Bake the pumpkin for 15 minutes. After 15 minutes, spread fresh thyme spring and garlic pod with skin and bake for another 15 minutes. While the pumpkin is baking. Cube the pealed carrots, celery and onions. In a hot pan, add one table spoon of olive oil and sauté the vegetable along with salt and smoked paprika till they are soft but not mushy. After pumpkin is cooled, peal the skin and collect the pulp. Blend together cooked vegetables, pumpkin pulp, baked de-skined garlic. Add water while blending and more salt if required. Serve warm with splash of olive oil and roasted pumpkin seeds. 2. To roast the pumpkin seeds, collect the seed from pumpkin towel dry the seeds and let them roast in wide bottom pan on low-medium heat. Peal the skin and serve along with soup.....or you could easily go with store brought pumpkin seeds. scrumptious soup n classy pics..
Looks like you ar eusing the smoked paprika you got from Spain. I love fresh walnuts too but if i eat too much of them i get scratchy throat. Wat a prefect soup for this chilled fall season..Makes a comforting soup. 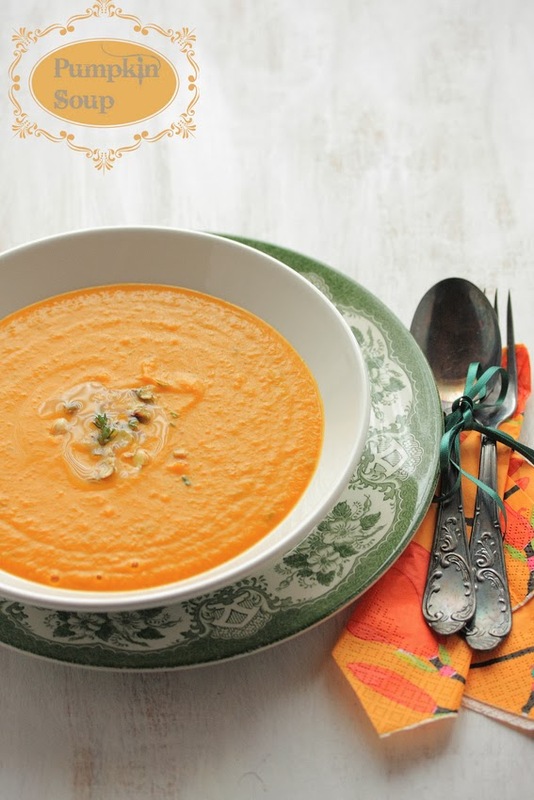 The pumpkin soup looks really warming and delicious.I love the click. It would be lovely if you link it to lets cook with pumpkin event at simply.food as the recipe is perfect for the event. Thanks for the mention! Sounds lovely with paprika!